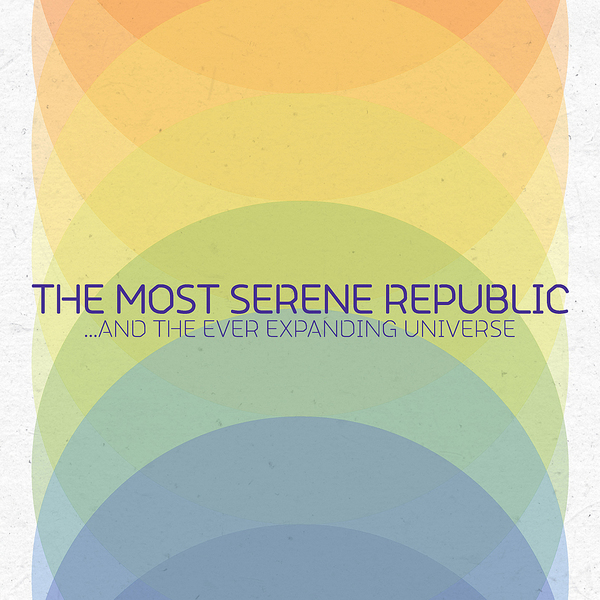 Last seen reimagining their previous album Population as a series of 16-bit MIDI pop songs, The Most Serene Republic are back to full strength with this latest full-length - the Ontario sextet's third proper LP. For this outing the band are joined by producer David Newfeld, who seems to specialise in assisting ambitious rock bands with expanded line-ups realise their sound. Newfeld's previously worked on records by the likes of Los Campesinos!, Super Furry Animals, and surely most relevantly, fellow Canadians and Arts & Crafts residents Broken Social Scene. ...And The Ever Expanding Universe is a sonically rich collection, with an almost overwhelming amount of depth, calling upon overdriven, saturated engineering to add extra heat to a mix that already throws together swathes of different instruments. There's a lot to take in here, from the pretty, articulate strains of 'The Old Forever New Things' to the electronically manipulated beats of 'Catharsis Boo' and 'Don't Hold Back, Feel A Little Longer'. On top of all the hyperactive ensemble pop that engulfs most of the songs on offer here, you'll find more expansive sounds towards the album's centre: 'Patternicity' stands out as more than an interesting orchestral diversion, sounding like a particularly strong Philip Glass piece when it's in full flourish, and underlining this group's incredible strengths when it comes to arrangements.